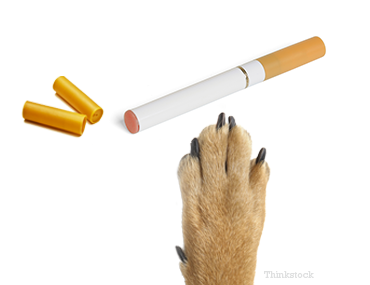 Recently, a puppy died after ingesting part of an electronic cigarette. While the story went viral on social media, the question that remains is just how poisonous are electronic cigarettes? First, as a non-smoker, I love electronic cigarettes as there’s no second-hand smoke exposure to innocent bystanders (e.g., family members, dogs, and cats). That said, they still pose potential health risks to the smoker and to any pet that accidentally ingested them. Here, you can find more information about electronic cigarettes from the FDA. Electronic cigarettes basically work by converting the nicotine solution into a vapor instead of a smoke so that the vapor can be inhaled by the user. What are the dangers of electronic cigarettes for my dog? The problem is that these cartridges can contain different amounts of nicotine ranging from 16 to 24 mg per cartridge. That said, electronic cigarettes are just as poisonous as regular cigarettes or cigars. The threat varies depending on how much nicotine is ingested. When it comes to poisoning, there are two potential concerns with electronic cigarettes: the amount of nicotine and the battery (which can cause corrosive injury depending on the type of battery). Depending on how much nicotine is ingested, severe poisoning can be seen in dogs. Clinical signs of nicotine poisoning can be seen within several minutes; they can last for 1-2 hours (in mild cases) or 18-24 hours (in severe cases). How often is nicotine fatal for dogs? Unfortunately, it only takes a small amount of nicotine ingestion to result in canine poisoning. Clinical signs of poisoning can be seen after ingestion of even one cigarette–-whether it’s electronic or a regular unfiltered cigarette. 9-12 mg/kg of nicotine will kill 50% of dogs; it often depends on the size of the dog and the amount ingested. Treatment includes appropriate decontamination (i.e., inducing vomiting and giving a dose of activated charcoal to bind the poison from the intestines), intravenous fluids to help hydrate the pet, anti-vomiting medication, anti-seizure medication, blood pressure medication, heart medications to stop the arrhythmias, sedation (to relieve the severe anxiety), and blood pressure or heart monitoring with an electrocardiogram. When in doubt, make sure to keep anything containing nicotine out of reach. The most important thing to remember is that the sooner you identify that your pet is poisoned, the sooner (and less expensive) it is to treat. When in doubt, contact your veterinarian or ASPCA Animal Poison Control Center immediately for life-saving care.